We all know that the lack of sanitation is the cause of diseases such as , cholera, and typhoid. In fact, according to WHO (the World Health Organization) nearly 500,000 children under the age of five die every year. And as we all are aware, proper sanitation and hygiene creates an enabling environment, and helps secure the health and safety of all. The improved health of the children also results in better school attendance, another very important issue. Sadly, some of our children and their guardians at Brave Hearts have not had access to these basic necessities. Some of the girls and women told of their personal challenges to find a suitable outdoor space to use as a toilet, as finding a place that is private and also safe is often impossible in and around Kebena. BHE started its Operation Flush Toilet Project in late 2014, after we discovered that two young girls, Sebie and Kebedech, were missing classes due to ill health. After our social workers did a thorough assessment, it was found that the girls kept falling sick because of lack of the proper toilet facilities in their village. “I only came home to sleep late at night, because the smell during the day was impossible to cope with. My home shared the semi-broken toilet wall and was often soaked with human waste”. Realising something must be done immediately to stop the direct risks caused by this situation, BHE started work right away with the local government and community members to renovate and install new toilet systems. Head of the local administrative office, Ato Alemayehu, expressing his gratitude to BHE and the Australian Embassy In Addis Ababa. The reconstruction took about three months and was not an easy project. The area around the toilet had to be cleaned and dug in order to construct a new 48 meter cube septic tank. New pipe systems were laid in order to ensure clean and safe means of waste disposal. The toilet was also reconstructed to have three toilet rooms with flush water systems and one shower room with appropriate water flow systems. Hand washing basins were also constructed. "in days I used to not drink water so I wouldn’t have to go looking for a private place” I’m overjoyed that this wonderful, bright girl now benefits from the Brave Hearts toilet project. 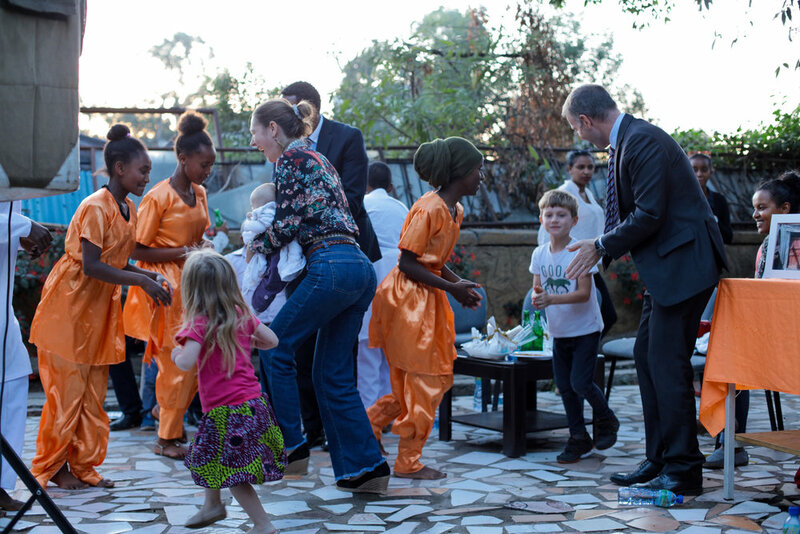 Ambassador Mark and his wife Anais Maro, BHE board of directors Ethiopian national team coach Abrham Meberatu celebrating with BHE’s children at BHE’s drop in center. There is nothing more fulfilling than a project which has met its goal of bringing about changes in the lives of those it aimed to support. BHE has taken this success and was inspired to keep working on toilet projects that will make meaningful and wide-reaching steps to improve and create healthier and happier communities for the children (and their families) we support. Thus, with funding support from The Australian Embassy and the Australian Government, DIRECT AID PROGRAM, and our friends at Stream Construction, we are delighted to now completed Operation Flush Toilet Project 2, a new toilet facility with septic tank, four showers, four toilets and hand washing basin, fully tiled and with improved piping system. This toilet facility will serve 36 households, 180 members of the Brave Hearts community. We believe there is no more rewarding job than helping communities, especially children, to transform their lives.